Keeping your bagged equine feeds fresh helps ensure they are safe and nutritious for your horse. We asked Eric Haydt, vice president of sales and marketing at Triple Crown Nutrition Inc., and Harold C. McKenzie III, DVM, MS, Diplomate ACVIM, and an assistant professor of equine medicine at Virginia Tech’s Marion duPont Scott Equine Medical Center, for their recommendations on product freshness. “Keep bagged feeds out of weather,” Haydt says. Feeds kept in direct sunlight, damp or wet conditions or high temperatures will spoil quickly. 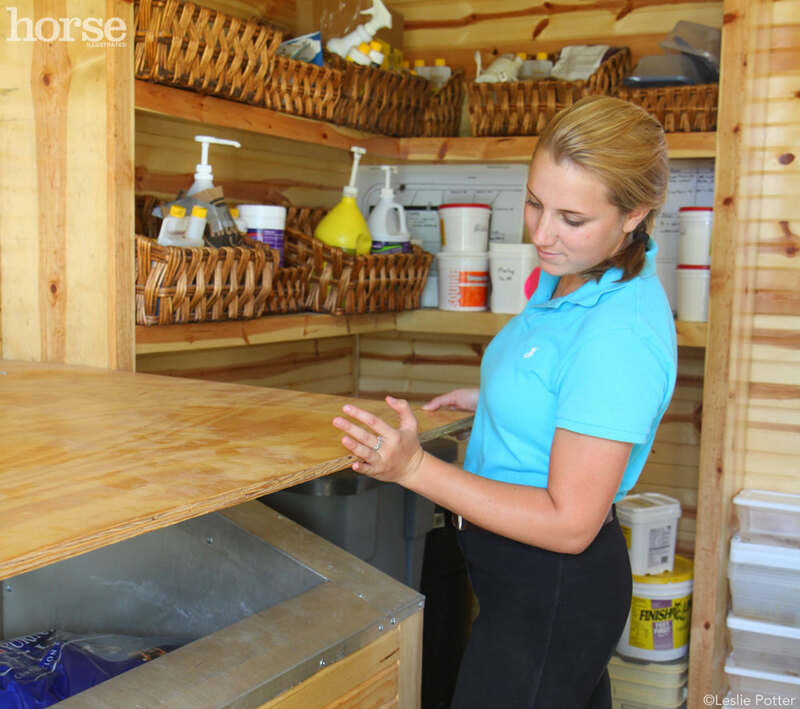 Instead, Haydt recommends storing feeds inside tack rooms, away from the elements. “Also, don’t put bagged feeds on the ground. Store them on pallets instead,” he says. The pallets protect products from moisture and ground-dwelling bugs and rodents. It’s not a bad idea to place a bagged feed in a pest-proof container, but use common sense. “Before adding new feed into a storage container, empty out all the old feed,” Haydt advises. All products eventually spoil, and moldy old feed will taint your new stock. Obvious signs that a feed has spoiled include infestation by insects or rodents, as well as feed that looks or smells bad. Also, watch your horse: If he refuses to eat a product he’s always gobbled down with gusto, assume the feed has spoiled and either throw it away or return it for a refund. Most manufacturers don’t print “sell by” dates on their product labels. Hayde says most textured feeds are best if used within 45 days of purchase – pelleted feeds are best if used within 60 days of purchase. Of course, you might not know how long a product was sitting on a feed store shelf before you bought it. However, many manufacturers include lot numbers and dates on their product labels. If you have any concerns, contact the manufacturer to find out how fresh the product really is. Thank you for the quick review and common sense. All great advice that I follow assiduously. I don’t want to waste precious money on spoilt feed! And I don’t allow any moisture in my feed room at all. If something is wet from a ride it has to dry out before it’s allowed back in. I’m glad they qualified the “use by” idea. We own a feed a store and the problem with the “use with 45 days of purchase” is that it’s not really relevant. If you buy from a store that carries a lot of feeds, it might be that some of those don’t move quickly. We only carry two manufacturers and there isn’t a bag of feed that sits here more than a month. In fact, many don’t make it a week. Having said that, realize that if you buy a specialty feed and if it’s the last bag on the pallet, it MIGHT have been there for quite a while. Some mills don’t put dates on their products so you just have to either know what moves or ensure their is an exchange policy with your store.